New herbicide product registrations and label updates continue to bring more choice to farmers, with multiple modes of action to manage weed infestations and herbicide resistance. The following product information has been provided to Top Crop Manager by the manufacturers. Command 360 ME with clomazone (Group 13) is a new herbicide for control of cleavers in all herbicide-tolerant systems. It can be applied pre-plant in canola to control early flushes of cleavers, allowing better in-crop herbicide performance. Focus with pyroxasulfone (Group 15) and carfentrazone (Group 14) is a new pre-formulated liquid product for pre-plant/pre-emergence use in wheat (spring and winter), field corn and soybeans. Focus herbicide provides pre-emergent control of green and yellow foxtail, barnyard grass, downy and Japanese brome, redroot pigweed, cleavers and suppression of wild oats, kochia, lamb’s-quarters, wild buckwheat and wild mustard. Luxxur with thiencarbazone (Group 2) and tribenuron (Group 2). Luxxur is an innovative new wheat herbicide that offers control of tough grass and broadleaf perennials. The formulation not only knocks out wild oats, but also takes care of problematic weeds like dandelions, Canada thistle, and narrow-leaved hawk’s beard. Rexade with pyroxsulam (Group 2) and halauxifen (Group 4). Rexade is a complete wheat herbicide for use in spring wheat, winter wheat and durum that delivers grass and broadleaf weed control and good performance across a wide range of conditions. Rexade controls key grass weeds such as wild oats, yellow foxtail, barnyard grass and Japanese brome, and has overlapping multi-mode broadleaf weed control of cleavers (up to 9 whorl), wild buckwheat (one to eight leaf), chickweed, hemp-nettle, lamb’s-quarters and others. Solo Ultra with imazamox (Group 2) and sethoxydim (Group 1). Solo Ultra is a new co-pack that combines the targeted control of tough broadleaf weeds and rotational flexibility of Solo ADV with the improved grass control of Poast Ultra. Solo Ultra provides multiple mode of action control and an extended window of application for grassy weeds in one package, plus built-in adjuvant for easier handling and reduced fill-up times. Solo Ultra is registered for use in Clearfield canola, Clearfield lentils, Clearfield sunflowers and soybeans. Cirpreme with clopyralid (Group 4), florasulam (Group 2) and halauxifen (Group 4). Cirpreme provides systemic broadleaf weed control of annual and perennial weeds such as dandelion, perennial sow thistle, Canada thistle and narrow-leaved hawk’s-beard. Cirpreme can be used in-crop in barley, durum, spring and winter wheat and provides the GO benefits of Arylex Active, including performance on big or small weeds, early or advanced crops and under variable weather conditions. Engenia with dicamba – BAPMA salt (Group 4). The advanced dicamba formulation of Engenia will offer growers greater flexibility and ease of handling due to lower use rates, tank-mix flexibility and lower volatility properties. Engenia herbicide is registered for use in the new Roundup Ready 2 Xtend soybean system (dicamba-tolerant) and all conventional dicamba registrations. ForceFighter M with fluroxypyr (Group 4), bromoxynil (Group 6) and MCPA Ester (Group 4). The ForceFighter M co-pack contains three active ingredients and two modes of action to help fight herbicide-resistant weeds, including Group 2- and glyphosate-resistant kochia, Group 2-resistant cleavers and wild mustard, and all types of volunteer canola. ForceFighter M can be tank mixed with a number of products for one-pass control in spring wheat, winter wheat, durum and barley. Infinity FX with pyrasulfotole (Group 27), bromoxynil (Group 6) and fluroxypyr (Group 4). Infinity FX is a new cereal herbicide that provides a wide spectrum of broadleaf weed control. It combines the power of three herbicide groups, making it a good resistance management tool. Infinity FX provides you with fast-acting control of your toughest broadleaf weeds, including cleavers, kochia, buckwheat and now volunteer flax. Authority 480 with sulfentrazone (Group 14). Authority 480 is now registered for pre-plant or pre-emergence application in fababean and tame mustard (low rate only for kochia control) along with field peas, chickpeas, soybean, flax and sunflower. Authority provides pre-emergent control of kochia, redroot pigweed, lamb’s-quarters, wild buckwheat, common groundsel, and common purslane and suppresses cleavers. Authority Charge with sulfentrazone and carfentrazone (Group 14). Authority Charge is now registered for pre-plant or pre-emergence application in fababean and tame mustard (low rate only for kochia control) along with field peas, chickpeas, soybean, flax and sunflower. Authority provides pre-emergent control of kochia, redroot pigweed, lamb’s-quarters, wild buckwheat, common groundsel and common purslane and suppresses cleavers. Express Pro with metsulfuron and tribenuron (Group 2). Express Pro is now registered for a 22-month re-cropping interval to lentils after a pre-seed application. Heat LQ with saflufenacil (Group 14). The Heat LQ label has been expanded with several changes. Heat LQ is now registered for residual suppression of cleavers in pre-seed applications. It is also registered for pre-harvest applications on chickpeas and red lentil. 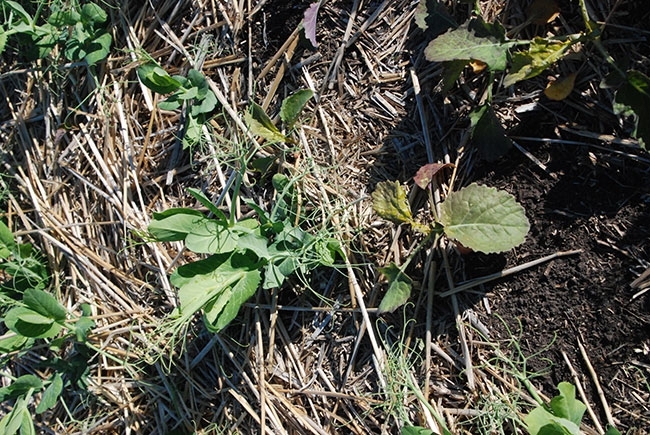 The weeds registered for pre-harvest weed dry down now include volunteer canola, Canada fleabane, redroot pigweed and wild buckwheat. Korrex II with florasulam (Group 2) and dicamba (Group 4). Korrex II is now available featuring a new package configuration and a spring rate treating 80 acres per case. When mixed with VP480 or other glyphosate formulations at 7.5 grams per acre, Korrex II is a strong pre-seed burndown option ahead of barley, durum, oats and spring and winter wheat offering control of early emerging and overwintering weeds, including Group 2- and 9-resistant kochia. Odyssey NXT with imazamox and imazethapyr (Group 2). Odyssey NXT provides the same reliable weed control as Odyssey but with the updated packaging convenience of two 692-gram jugs instead of eight water-soluble bags and the addition of Merge adjuvant to the package. Each case now treats 80 acres. Odyssey Ultra NXT with imazamox and imazethapyr (both Group 2) and sethoxydim (Group 1). Odyssey Ultra NXT updates the packaging format of Odyssey Ultra to utilize two 692-gram jugs of Odyssey NXT versus the eight water-soluble bags of Odyssey previously used. Odyssey Ultra NXT also contains Merge adjuvant and will treat 40 acres per case. Paradigm with florasulam (Group 2) and halauxifen (Group 4). Paradigm has received a new use registration for pre-seed applications prior to planting for all wheat varieties, durum and barley. Paradigm for pre-seed offers control of tough weeds, including Group 2-resistant cleavers and hemp-nettle in the Black soil zone, as well as early emerging broadleaf weeds like wild buckwheat, dandelion and many winter annual weeds. Simplicity and Simplicity GoDRI with pyroxsulam (Group 2) tank mixed with Stellar XL, featuring florasulam (Group 2), fluroxypyr (Group 4) and MCPA (Group 4). This tank mix is now registered for control of white cockle. Simplicity and Simplicity GoDRI with pyroxsulam (Group 2) tank mixed with Paradigm, featuring florasulam (Group 2) and halauxifen (Group 4). This tank mix is now registered for control of white cockle. Travallas with thifensulfuron (Group 2), metsulfuron (Group 2), fluroxypyr (Group 4). Travallas, for use in spring wheat, durum wheat and spring barley, is now registered to control volunteer flax and night-flowering catchfly (up to 10 centimetres). Lentils may be seeded 22 months after an application of Travallas herbicide.